​For the young and young at heart! Performances, exploration and lunch at the Land of Little Horses where a full-time staff of performing animals take the stage for guaranteed laughs! Get up close and personal with our famous namesake miniature horses and their farm animal friends. Shows, Displays, and Special Events are sure to delight the kids and “kids at heart”. ​Open 7 days a week April through October. A wild adventures with East Coast Exotic Animal Rescue. Open Saturdays and Sundays May through September. The non-profit sanctuary provides a lasting refuge for more than 40 species of exotic animals including birds, carnivores and reptiles. 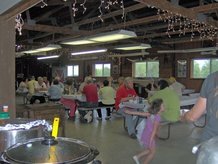 The Historic Round Barn and Farm Market offers a wide selection of own grown and local fresh fruits and vegetables during the season. There are many interesting food, decorative and gift items available that fill the shelves as they curve their way around the interior of the barn. Open daily early May through October 9 am – 5 pm. Enjoy dinner and some shopping on Steinwehr Ave. With over fifteen restaurants along Steinwehr Ave. you are sure to find dining to suit your group's appetite. Walk off your meal as you take time to enjoy the more than 20 unique gift, history and souvenir shops of this "Destination Within A Destination". Civil War Tails at the Homestead Diorama Museum. A unique museum featuring hand-made dioramas and thousands of specially-crafted miniature soldiers, who are actually cats in uniform. You’ll find stories of the courage, perseverance, and dedication of the people who fought, lived, and died during the Civil War. Experience the beauty and history of Gettysburg’s battlegrounds with a Licensed Battlefield Guide. Gettysburg’s guides bring to life the history of one of America’s most famous battles. Guides offer walking tours, tours on bicycles, horseback, Segway and mopeds as well as bus tours including those sponsored by the local Gettysburg Tour Center. With over 6,000 acres of nature preserve Strawberry Hill offers eight hiking and educational trails open from dawn till dusk, a Nature Center with various artifacts, reptiles, amphibians and educational displays, a 1798 Civil War Log House, a foundation and spillway for an 1850’s sawmill, a picnic grove, pavilions and more. 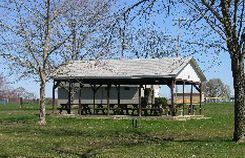 Enjoy a picnic lunch at Strawberry Hill, Gettysburg Recreation Park or Artillery Ridge Campground Picnic & Event Pavilion. Visit the animals at Catoctin Wildlife Preserve & Zoo where people and animals who jump, swim, fly, roar and tweet to greet you get closer together. Experience our petting zoo, explore animal encounters at the conservation center and meet the keepers. You can even add a safari ride to your tour. ​Stop for lunch in the Heart of Gettysburg’s Battlefield at General Pickett’s Buffet. Terrific home cooking, great service and hospitality await you beside the fields of Pickett’s Charge. ​See the entire 6,000-acre battlefield at one time at the Gettysburg Diorama. With over 20,000 hand painted soldiers, horses, cannons and buildings, the Gettysburg Diorama includes a thirty-minute light and sound show of the three-day battle of Gettysburg from the first shot fired to the last moments at the high water mark of the Confederacy. Sit back and watch as the three days of battle play out before you. A must see to understand the Battle of Gettysburg. ​Walk across the historic Sach’s Covered Bridge. It was crossed by both Union and Confederate Troops during the 1863 Gettysburg Battle. The lattice bridge spans 100 feet and is located off Pumping Station Road..
Cruise on into the Eastern Museum of Motor Racing and view a collection of vintage racecars, artifacts, research library of rare books, and sport of auto racing documents & photos, plus a gift shop. The museum is open April through October but is happy to open specifically for a group of thirty or more any time of year. Stop for lunch at any of the areas delicious dining attractions. ​Experience childhood at Explore & More Children’s Museum. Created by pre-school teachers, Explore and More is a Hands-on Children’s Museum dedicated to providing fun, challenging, educational experiences and activities for children ages 3 to 8, but enjoyed by the young at heart of all ages!